Coyote Creek - Apache County, Arizona, Headquarters West Ltd. 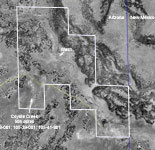 The property is located in eastern Arizona near the New Mexico state line in southern Apache County approximately 200 miles northeast of Phoenix, Arizona and 170 miles southwest of Albuquerque, New Mexico. The property is situated ½ mile south of US Hwy 60 along Coyote Creek and 11 miles east of Springerville, near the White Mountains of Arizona. 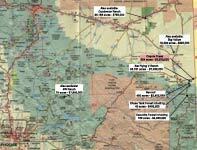 The property is accessible by 8 miles of paved US Hwy 60 east from Springerville, Arizona to County road #4225 (maintained gravel), then 3½ miles southeast on #4225 to a dirt road, then 2 miles east to the boundary. The land is contained in an irregular block along Coyote Creek. The creek is a dry wash and only runs during periods of heavy rain or significant snow melt in the spring time. The deeded land is completely surrounded by State Trust land in Arizona and neighbors the Escudilla Bonita subdivision across the state line in New Mexico. There are no building improvements located on the property. Topography includes rolling hills with scattered Pinion Pine and Juniper trees, overlooking the Coyote Creek arroyo. The arroyo and hillsides are made up of red and tan sandstone formations with many large boulders scattered among the trees. A large malpais mesa lays along the eastern boundary of the property providing a private atmosphere. There is no developed water on the property, however; wells in the area vary between 100 and 400 feet deep with domestic drinking water quality. Plains & Desert Grassland, Pinion/Juniper Woodland and Montian-Conifer Forest. Primary grasses include Kentucky bluegrass, pine drop seed and mountain muhly on the summer range and blue grama, black grama, squirrel tail, needle & thread on the winter range. Browse species include white sage, blue sage and chamisa. Average annual precipitation ranges from 10 to 12 inches with the majority coming in the late summer months during the monsoon season. Winter months will see snowfall on occasion typically melting down after a few days. No public utilities are currently in use on the property. Electrical service lines are located across the state line in New Mexico within a ¼ mile of the property. Please click here to download (about 600kb) a printable brochure in Adobe Acrobat format. If you get frustrated trying to make this work on your computer, don't hesitate to ask us to mail you a printed and bound brochure instead.